Ms. Casey Pohl’s 3rd grade students at Exeter-Milligan have been learning about plants and animals in science. We have been learning the parts of plants, what living things need to survive, and how to classify animals. 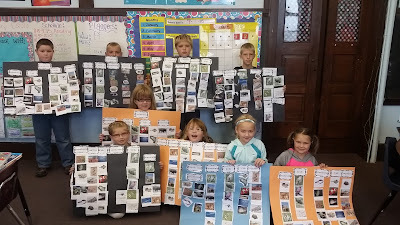 Pictured is the 3rd grade class holding their posters of the vertebrate animals. They were given pictures and had to classify them into the 5 groups of vertebrates. They enjoyed working on these and getting to help one another discuss the different characteristics of animals.